My husband is not shy about expressing his love of fish cakes. Since the first time I made my cod cakes, he was hooked. My younger son (the fish lover) quickly followed in his father’s footsteps. 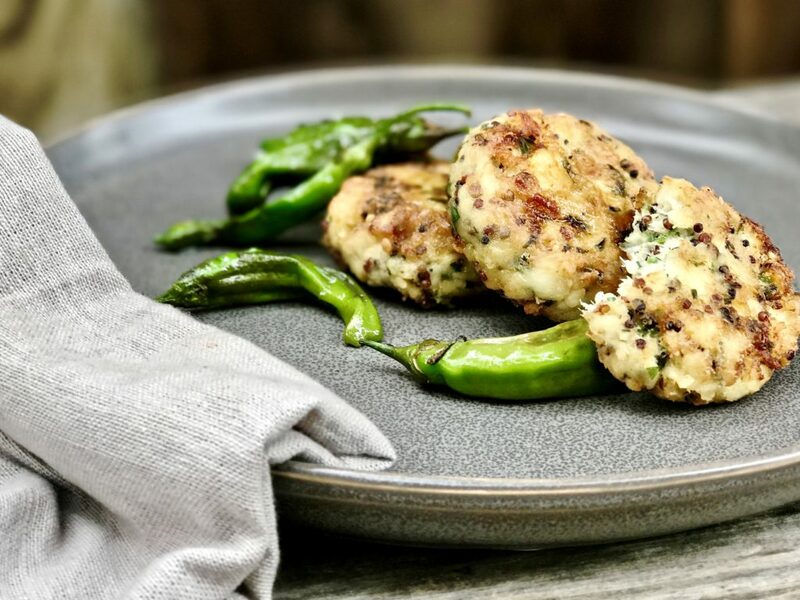 When I mentioned that I was developing a new fish cake recipe, eyes widened, there was excitement in the air–yet there was also concern that the new fish cakes could not be nearly as good as the old standard they had both come to love. Change can be hard, for some more than others! Selfishly speaking, I wanted a fish cake that I want to eat. This is a long-standing issue with many chefs. When you make something often enough, you stop being able to eat it. Seriously, my list is long. It’s been about 15 years and I still can’t eat crème brûlée. For this recipe I used flounder, an inexpensive, readily available, white, flaky fish. 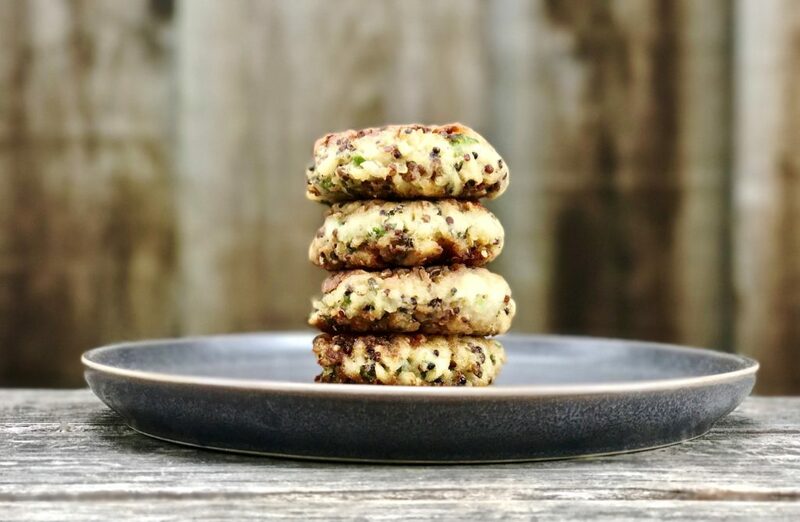 I wanted these fish cakes to have a bit more texture, so I added some cooked tri-color quinoa instead of your typical bread crumbs as well as some minced Shishito peppers. The peppers tend to be mild but every once in a while you will get a few with some heat; so there was a nice subtle kick that I liked. Fresh chives and lemon juice top off the dish and add a fresh flavor I was looking for. I use Wondra flour to coat the outside of these cakes before lightly pan-frying them. The Wondra flour helps create a crispy seal on the outside. 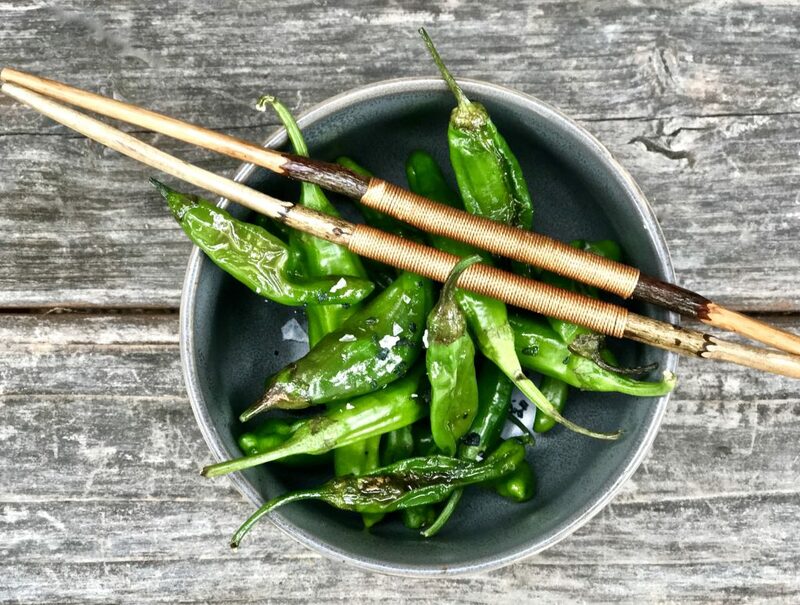 I served these with some additional lightly blistered Shishito peppers on the side, though you could easily substitute another vegetable or a starch if you prefer. This is not a labor-intensive recipe my any means, but I do suggest prepping most of it in advance. In addition to making this easier around dinner time, it also allows the fish cake mixture time to firm up a bit, which helps you cook them later on. 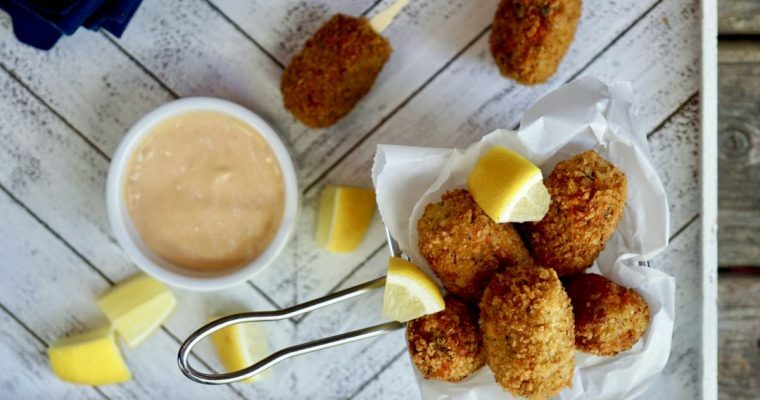 I liked the fish cakes as is, with just a bit a fresh lemon juice drizzled on top, but you could also serve with a simple lemon aioli if you want a more traditional sauce on the side. Step 2 Cook the quinoa per the package instructions. Cool and set aside. Step 3 Fill a medium saucepan halfway with water, place over high heat and bring to a boil. Once boiling, add the flounder and reduce heat to medium. Poach the fish for about 10 minutes until cooked through. Remove from the heat and drain in a colander. Allow fish to cool slightly. Step 4 Once the fish has cooled, use your hands to flake the fish into smaller pieces. Step 5 Place the fish in a large mixing bowl. Add the cooled cooked quinoa, Shishito peppers, chives, salt, pepper, 1/4 cup mayonnaise and lemon juice. Using a rubber spatula, gently mix to incorporate. Taste and adjust the salt and mayonnaise as needed. Set aside. Step 6 Place the Wondra flour in a small bowl near your work station. Using your hands, gently form the fish mixture into patties (8 in total). Note: The cakes will be delicate, so do this step carefully. If the cake is not sticky enough, add a bit more mayonnaise at this time. Form all the cakes and place on the prepared baking sheet. At this point you can cover and refrigerate the cakes until later if you desire. Allowing the cakes some time to firm up in the refrigerator is helpful. Step 7 To cook the fish cakes, lightly coat each cake in the Wondra flour and place back on the baking sheet. Step 8 Place a a good amount of vegetable oil in a large sauté pan over medium-high heat. Add 1 tablespoon of butter. When hot, but not smoking, add half the fish cakes and sear till golden in color, about 3-4 minutes. Using a metal spatula, carefully flip the cakes and cook for an additional 3 minutes on the other side. Remove the cakes from the pan and place on a plate lined with paper bowl. Repeat the above with the remaining fish cakes. Step 9 Serve warm with Blistered Shishito peppers on the side and additional lemon juice if desired. Step 1 Place a large sauté pan over high heat. Add the olive oil and when hot, but not smoking, add the whole Shishito peppers and cook, shaking the pan occasionally until you see some coloration and blistering in the pepper skin, about 3-5 minutes. Remove from the heat and sprinkle with flaky sea salt. 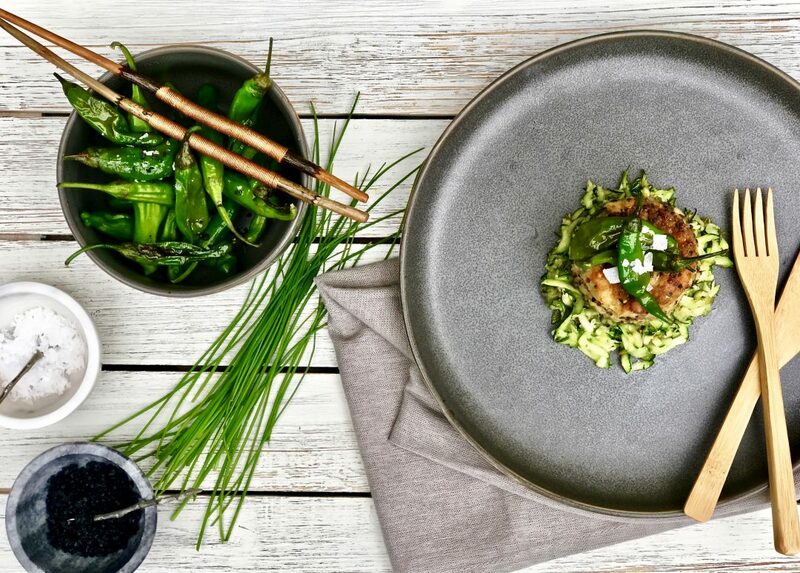 Step 2 Serve with Quinoa Fish Cakes.